Whether they are price stickers, clearance stickers, bumper stickers, or your childrens’ dinosaur themed stickers, all have the potential to leave seemingly permanent residue wherever they land. The adhesive that gives stickers their aptly named holding quality can be a menace, and in 2018, it is a wonder that an alternative has not yet been developed. There is no sense worrying about that, however. We can only control what we control, and when it comes to sticker residue that means utilizing the best tools at our disposal to remove leftover sticker adhesive from our garments, walls, newly purchased knick knacks, and more. While there is some crossover, the process of removing sticker adhesive is dependent on the item to which it is stuck. In this article, we have outlined the best ways for clothes, walls, windows, and other hard surfaces like metal, plastic, and wood. First and foremost, there is nothing more embarrassing than heading out into the world with sizing markers still attached to your new jeans. For this reason, and for the treatment of sticker residue, it is good to get into the practice of sticker check and immediate wash prior to wearing. Be sure you know the wash treatment of the garment and if there are any special wash instructions. You wouldn’t want to ruin a new wool sweater because you are solely focused on wiping that sticker glue off the face of the earth. In addition to the detergent you add to the load, rub some detergent direct to the sticker stain. You may also use a specialized stain remover if it is safe for that particular type of garment. Once you have pretreated the area, send it through the wash cycle as normal. It is imperative to check for the stain BEFORE you send it through the dryer. If the stain is still there, the dryer will harden the sticker residue, making it much more difficult to remove after the fact. Repeat the same treatment process if necessary. You may also dab some rubbing alcohol on the stain the second time around. Walls are quite possibly the worst and most foreboding place to attempt to remove a sticker. You are almost guaranteed to pull some plaster off or leave a large amount of the sticker itself, as well as its adhesive residue no matter what you do. Assuming that only the latter is true, here is what to do. Remove as much of the sticker as possible from the wall without ripping up the plaster. This means you have to go slow and be careful. Next, use a pencil eraser on the adhesive residue. You will see it begin to bunch up and flake off in shavings. Apply a hot, damp cloth over whatever is left of the sticker to clean the wall, and repeat as necessary. LIke any other glass product, windows are extremely stubborn about hanging on to stickers. That said, the temptation to use a sharp implement to scrape the sticker residue from the window is great. Don’t do it! There are other ways that offer far less risk of scratching. First, moisten any paper residue with a hot, damp cloth. After using the cloth, you will likely still have some glue residue. A great product to loosen adhesive on glass is nail polish remover. It should break down the glue right away and you will be able to roll it up into little chunks and pick it right from the window manually. For whatever remains, just use soap and warm water. If after all this you still can’t get the window clean, a scraper might be necessary. Use a razor, not a utility knife but a flat, flush razor meant for scraping. 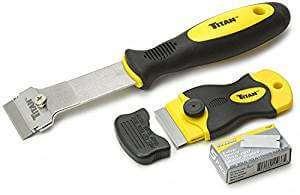 Be sure you have the blade in correctly and securely, and that you are using it the right way. That means the adjustment dial that raises and lowers the blade should be facing upward. Scrape in short, slow, gentle motions, pushing the scraper forward slightly. Kitchen appliances, cars, and dresser tops are just a few examples of places where stickers seem to find their way. In the case of each, chemicals can be tricky and may damage the material. The same is true of scraping. Instead, first try vegetable oil. Apply it to the area and let it soak. Next use a warm hair dryer over the area. The heat will soften the adhesive and you should be able to wipe it clean. For whatever is left, use soap and water. Stickers can be a tremendous nuisance, but the stains, paper, and glue they leave behind do not have to be permanent fixtures. The important thing is to be sure you understand the best process for removing stickers from a particular item. This means considering the material of the item and what types of substances or implements might harm that item. Once you know exactly what you are working with, follow the guide outlined above, and you are sure to claim another victory in the war with sticker stains.